The best family reunions have family participation and at least one truly memorable experience to meld generations and make memories. To inspire planning, the FamilyTravelFiles.com has just posted seven tall ship family reunion ideas that have exceptional memory making potential. 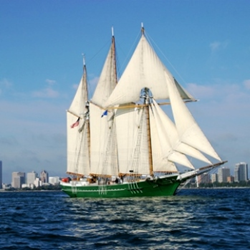 As Wisconsin's flagship, the S/V Denis Sullivan sails Lake Michigan and offers a WOW! tall ship family reunion experience for three generations. The best family reunions include something for everyone plus a cool WOW! experience that can be shared by three generations. Family reunions always start with when and where? The why is obvious to the oldest members of the family – it will be fun and who doesn’t want to have fun? But vacation time is precious and often in short supply so enticing family members to suggest fun family reunion ideas and then commit to a family vacation which includes a reunion often takes planning and negotiations starting with the fun part. But fun has many definitions and what sounds great to older generations may not sound so cool to teens or 20-somethings. The best family reunions include something for everyone plus a cool experience that can be shared by three generations, will create lasting memories, and deliver bragging rights for the wired participants. To enjoy any of the newest tall ship family reunion ideas gather the family together and just add water. The fun is included. 1. Liberty Clipper and the Liberty Star sail Boston Harbor. Families can be part of an interactive “Boston Tea Party” sail experience with costumed actors recreating the historic event. 2. American Rover sails from Norfolk. Passengers are invited to engage with the crew in sailing activities including time at the helm. 3. Schooner Pride embarks departs from Charleston. Passengers of all ages are invited count dolphins and participate in the sailing of the vessel. 4. The Freedom sails the Matanzas River and the Atlantic from St. Augustine. Sail for a sunset or participate in a Marineland dolphin cruise experience. 5. S/V Denis Sullivan sails on Lake Michigan. During Milwaukee’s Summerfest, the schooner sails at sunset just in time to provide passengers with a remarkable view the lake front fireworks. 6. Californian hosts anchor in San Diego Bay. Work alongside the crew and stand alert for the cannon salute. 7. Schooner Zodiac plies Puget Sound from Bellingham. Join a public sail and take part in the sailing activities – hoisting the sails or steering the vessel. Dozens of family reunion ideas along with timely advice may be viewed the family reunion planning folder at the website. About the FamilyTravelFiles.com. Established in 1998 theFamilyTravelFiles.com has grown steadily to become one of the most popular family vacation planning sites in the US. The website showcases a variety of family vacation options and focusing on the “good stuff” for families including unique family adventures and memory making experiences. Travel Communications Inc. provides innovative ways to highlight travel destinations and showcase new ideas for select number travel industry partners. The parent company is Travel Communications Inc. established in 1982 to meet the needs the travel industry by providing content research and creation, online publishing, and vacation product development.